Those mourning the end of wintry festivities might be interested to know that recently opened bar Public will be holding a rather special Burns night supper this January. Their version of the traditional celebration of Scott poet Robert Burns will involve”a night of fine food and even finer whisky”, all themed around the rugged Scottish classics. We can expect top notch offerings from the chic cocktail and food bar, if you’ve not heard about them yet, get up to speed. 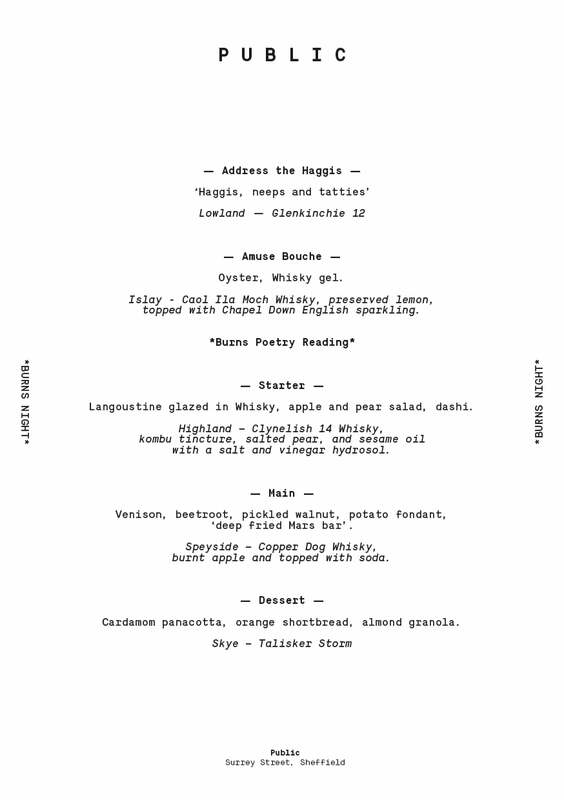 Have a look at their menu below to whet your appetite. Burns night supper will take place on the 25th January from 7pm. Tickets are £70pp, email publicsheffield@gmail.com – to book your place. Steroids – What Happens When You Take Them?